The Perfect Place for Lunch or Dinner…at DOMO! 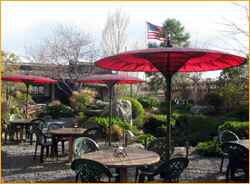 Spring is here, and weather permitting our garden seating is now open for lunch and dinner! Come down and join us for a fabulous meal in a fabulous setting…AT DOMO! chili sauce dressing. Served over sushi rice. 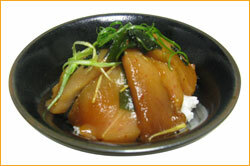 Until now, Domo Restaurant has used kihada maguro (red yellow fin tuna) in our wanko sushi and sashimi donburi dishes. However, recently kihada maguro has been added to the world endangered species list. Due to its popularity in sushi restaurants, kihada maguro has been severely over fished and there is now a serious shortage world-wide. Concerned about the ecological balance of our planet, Domo Restaurant will do its part by discontinuing our use of kihada maguro. We are changing our fresh sashimi selection to vincho maguro (white albacore tuna). This fish is plentiful and wonderfully delicious, comparable in taste and texture to toro. In our opinion, vincho maguro is even more delicious than kihada maguro, and is not endangered. In today’s world we need to shop not only for quality and price, we must be conscious the world’s ecological balance. Therefore Domo has changed from red to white in the sashimi department; more delicious and more ecologically mindful. If you have your heart set on red kihada maguro, we suggest your local sushi bar! Westword Best Japanese – 13th Consecutive Year! Thank you Denver! Domo Restaurant named Westword’s Best Traditional Japanese Restaurant 2009 for the 13th Consecutive Year! Mr. Homma traveled to four countries in South East Asia this past February and March to work directly on some of the humanitarian assistance projects sponsored by Domo Restaurant. Besides being the owner and head chef of Domo Restaurant, Gaku Homma is also the Founder of Nippon Kan International Headquarters in Denver. He is a renowned Aikido instructor who travels world-wide to teach the Japanese Martial Art of Aikido to students around the world. Mr. Homma is also a profound humanitarian activist and is the Founder of AHAN International (The Aikido Humanitarian Active Network) headquartered at Nippon Kan in Denver. AHAN currently has humanitarian assistance projects in over 30 countries. Kids with big appetites in Dhaka, Bangladesh. On this four week trip to South East Asia, Mr. Homma paid an annual visit to Mindanao Island in the Philippines, Nepal, Bangladesh and Yangon the capital of Myanmar (formerly Burma). He brought with him all that he could carry in the way of educational and hygiene related supplies, and worked to organize other deliveries of building supplies and rice to orphanages and other children’s assistance groups in all of these countries. Mr. Homma’s focus and philosophy at Domo Restaurant is multi faceted, but revolves around the principles and vision he has had since before Domo opened its doors in 1996. Mr. Homma’s first goal at Domo is to introduce traditional and authentic Japanese cuisine and culture to Denver, but for many years, he has also been realizing a dream of utilizing proceeds from his restaurant and other ventures to support others less fortunate in the world. Mr. Homma commented, “Today, food shows are popular on cable TV and they get more and more exotic as chef-contestants compete to determine who is the fastest or who can make the wildest creation. It is “food play” which I find a little concerning. There is also the ongoing sushi boom where customers try their hand at eating pricy and exotic delicacies. Yet while people are flocking to sushi bars in every growing numbers and countries, maguro tuna, hamachi yellow tail, unagi fresh water eel, mirugai giant clam and other sushi favorites are being added to the endangered species list. Fashionable in some countries; the price of one piece of sushi can feed an orphaned child for one day in other countries. You might ask, “Where is the money coming from for all of these projects, some large foundation or rich benefactor? No, is the answer, not in this case. Domo does not have a large advertising budget so we do not spend lavishly on ads in newspapers, magazines or directories. Advertising can cost some restaurants thousands of dollars a month alone, but we feel we have found a better use for these funds. Domo also has decided not to use delicate Japanese serving plates and bowls. We have discovered that by avoiding fancy serving plates we can save over $6000 a year in what we would have had to throw away in chipped plates! By saving where we can, we have found that Domo is able to help support projects around the world that help give back what has been generously given to us. By just being mindful and saving where we can, the same operating budget offers different opportunities at Domo. Domo Restaurant also supports the Nippon Kan Cultural Tour Program for school aged children. On average over 3000 students per year visit Nippon Kan and Domo for an excursion into Japanese culture and a Domo lunch! Modest proceeds from these tours also support AHAN International projects world wide. With our customer’s support and a watchful eye on expenses, we have found that we can save enough per month to supply 1000 children with enough rice for two meals a day for one month period. It’s a good start, but there is farther to go! All of us at Domo thank all of you very much for your continued support! View the AHAN Asia Tour Photo Album 2009. The photos in this album were taken by Mr. Homma between February 19th and March 16th, 2009. NOTE: All photos were taken with permission for use on Domo and Nippon Kan AHAN Headquarter websites and archive-newsletters. Please do not use or duplicate without permission. For more information on Aikido Nippon Kan and AHAN activities link to www.nippon-kan.org. DOMO Customer Appreciation Party and AHAN fundraising sale! We had planned to hold this party for our customers and friends this spring, but our plans were interrupted with the heavy spring snows. Plans for rescheduling this fall will be coming soon! Then dine IN with Domo’ s NEW Express take-out menu for lunch and dinner! Domo Restaurant now features our Domo Express Take-Out Menu for lunch and dinner. All entrees include three of Domo’s famous country side dishes, miso soup and brown or white rice with barley. Order by phone or come in to order a delicious Domo meal to go! Currently Nippon Kan’s local and international cultural and humanitarian efforts are conducted through AHAN (The Aikido Humanitarian Active Network). Nippon Kan AHAN supports projects world-wide and Domo is a primary sponsor for all AHAN activities. Two of our many projects include supplying one ton of rice per month for two orphanages in Bangladesh and locally, eighteen years of consecutive service and 50,000 meals served to the homeless at the Denver Rescue Mission. Click here be removed from this mailing list.